I got an interesting request this week, to improve the usability of the tabular model they wanted to filter the dimension table to only contain the rows that have data in the fact table. That way the slicers and other filters will never have data where you don’t have any sales or any facts. Often this is taken care before loading the data by creating view or writing queries but in this case this would have been expensive and time consuming for all tables in the model. 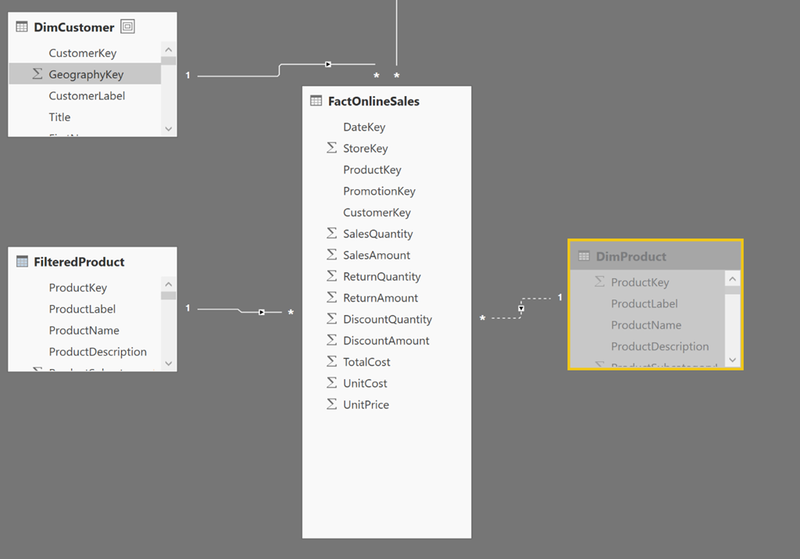 But there is a way to do this in Power BI \ SSAS by using calculated tables. 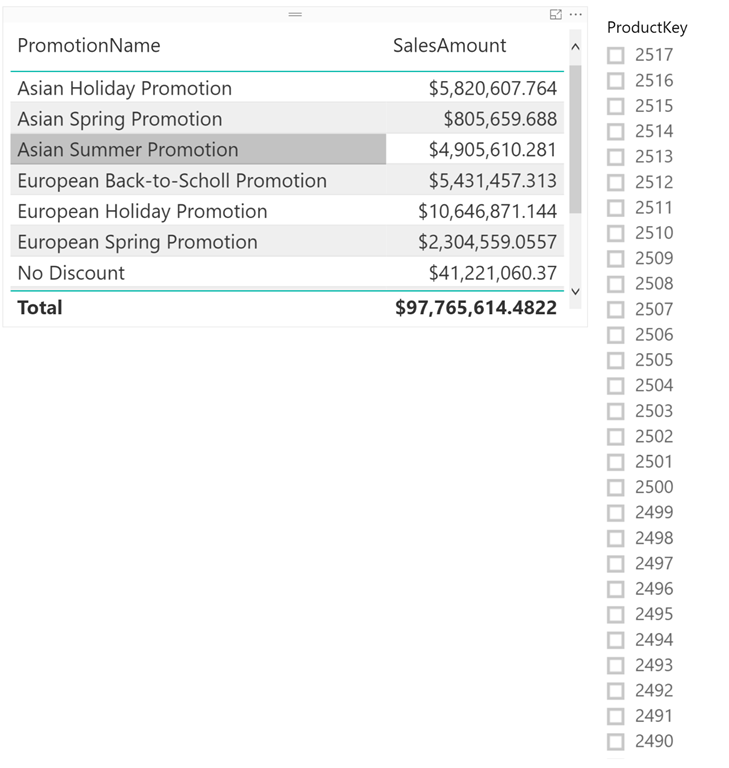 I filtered the FactOnlineSales table in the query to exclude some products. I ended up with a sales table that only contains data for 2 product, the product tables has 2517 products in total though. In short: Filter the rows in the DimProduct table to keep only those rows where we have more than 0 zero rows in the related sales table for the current product. Next PostFilter data based on a comma separated list using CALCULATE and PATHCONTAINS, even with external models! Is there any way to create calculated tables inside Excel? Like PowerBI, the next version of Excel could be have this feature of Calculated Tables. Not today, maybe at one point. Thanks David for helping me! I have just read that article. Excellent! Just curious, what was the motivation behind setting the relationship to inactive? I just think it would be cleaner, especially in a large model inactive relationships would never be in the way. Is there any way to do this with power query???? (And not bring inside the model the DimProduct table)??? Yes you can do this with PQ but that would translate into a query that would do a join to the fact table which was the whole reason to start looking for this work around, now the data is already in the model. yes but in this case that apparently was causing too much perf issues and maintenance as they want to use views for everything. 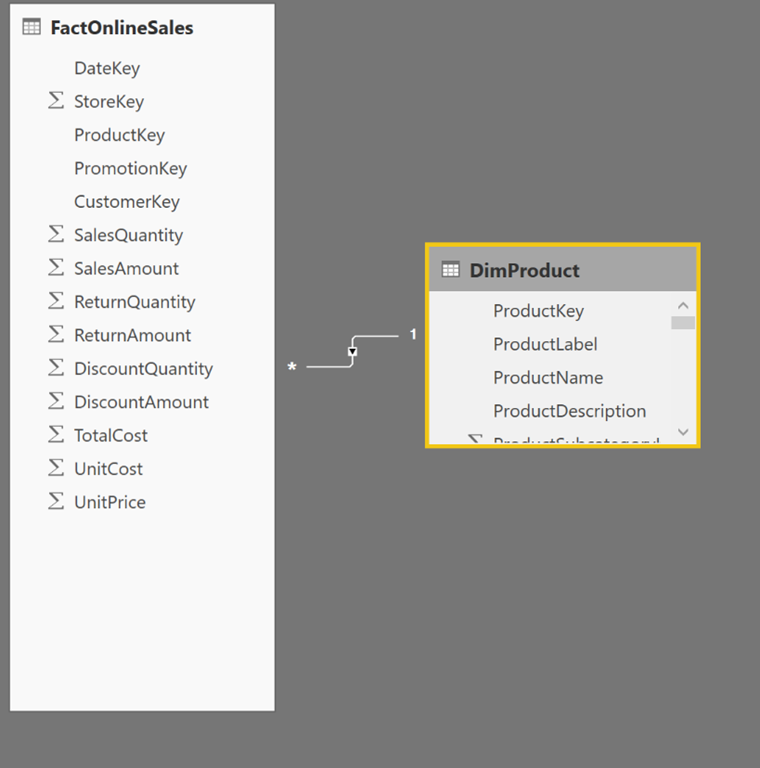 Turn on bidirectional filtering between FilteredProduct and FactOnlineSales. This will also solve this problem. No that wouldn’t solve the problem with the slicers, the filter from the fact table will only be applied when you add a value from the fact table into the visual which is not possible in slicers. Is there much performance loss if you added a report level filter where, “CALCULATE( COUNTROWS( dim ), RELATEDTABLE( fct ) ) > 0” is true? This is my normal approach which avoids having to add bidirectional cross filtering. Is “NOT IS EMPTY” more performant than “CALCULATE(COUNTROWS(Table) ) > 0”? this will always return the list of products that have at least one row in Sales. Hi, it will work with roles? I mean, The dimensions would show only the avaible rows for the role that have filtered the fact table? Felipe, I have the exactly same need – to show only dimension rows with values visible in fact table for user based on role level security. no because roles are calculated on the fly. You could use a RLS expressions to do this for you but it might be expensive. You would create an expression that only shows the rows that have sales (which is filtered by security).